Concrete is strong and durable, which made it a staple material in the construction industry. But it is also time consuming in more ways than one. DA approval for concrete structures can take weeks, due to detailed component breakdown and custom engineering. 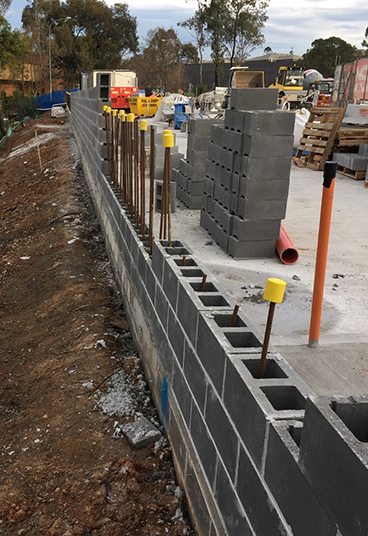 Preparation for concrete construction, including material procurement, organising specialised labourers and sourcing all appropriate machinery and plat hire can take another month to organise. Construction schedules are far longer for concrete structures than for newer construction technologies. In an industry where time is of the essence, keeping to tight build schedules are critical for a successful outcome. Time wasted on building means longer investment turnovers, and is simply no longer acceptable in our fast-paced economy. With so many different components to organise, a setback with one element can affect the entire build schedule. Their extensive strip footings are cumbersome to build, labour-intensive and timely, leaving you with excess spoil to then relocate. Forming or casting the concrete, laying blocks and curing time all add extra weeks to this already lengthy project timeline. As a rough example, for a run of 100m without difficult site conditions, traditional construction methods could take up to 9 weeks or more for a traditional concrete structure. When comparing to modular technologies, with pre-engineered components that are flexible to work around existing site conditions, the same results could be delivered in approximately 4 weeks. Thus, choosing traditional concrete methods will more than double your time. Concrete is more expensive to manufacture, transport and build. The engineering costs behind each custom-made structure is considerable, and its labour-intensive nature mean that less work can be done by labourers in a given timeframe, raising labour costs. Due to the recent housing boom, the demand for block- and bricklayers has rocketed, with material prices soaring. This unavailability and increase in costs make blockwork construction methods risky and expensive, threatening budgets, schedules and profit margins. For the same aesthetic as traditional concrete, composite panel technologies are more cost-effective to manufacture, transport and install. Looking to newer, more efficient technologies can save you a considerable percentage and be the difference between coming under budget and spilling over. Compared to more recent innovations that offer more lightweight materials, their excessive size reduces useable land space, causing major site disruption and inefficiency in plot planning. The variety of trades needed – from steel fixers to concreters to engineers to plant operators – result in a tricky network of contractors that need to work around each other and risks delays, friction and incompetence. Transport of mass concrete takes many vehicles and much longer, due to the immensity of the load. More lightweight materials these days are packed to volume, rather than weight, and thus are delivered more easily. This adds to its exponential carbon footprint, a liability for any developer seeking green star ratings, and fast becoming a key factor in DA approval and government considerations. Comparatively, more technologically advanced methods are using far more lightweight materials and innovative manufacturing methods to minimise their carbon footprint. Companies such as ModularWalls provide turnkey solutions for developers, taking a project from design to completion. The least desirable outcome for an expensive project is for it to need replacingor repairing not long after the initial construction. Design life is a vital factor in deciding the most economical and reliable solution. As pictured above, concrete structures can fast deteriorate, losing structural integrity and aesthetic value in as short as 5-10 years, in some conditions. When using such heavy, hard to handle materials, results in riskier installations and structural compromise, severely affecting design life. Compared to a modular wall structure that could potentially offer a design life of up to 50 years plus, the short design life of such concrete structures is an unsettling disadvantage. With this in mind, draw inspiration from the innovative technologies of the industrial and construction world and take a closer look at what’s available. Make an informed decision and speak to our in-house team about how our concrete-alternative structures can benefit your development.